Building a new home can mean a lot of great things for you and your family, including the opportunity to live in the home of your dreams; to save money compared to buying a prebuilt home; and the sense of accomplishment and satisfaction that comes with it. However, financing the construction process can often be difficult and time consuming. As licensed mortgage brokers, our job is to remove stress and make it easier for you to realize your dreams. On this page, we are going to break down the new construction mortgage process to make it easier to understand. First of all, consider there are two parts to construction financing. The "draw term," which is the initial construction phase providing the borrowers (for their builder/contractor/trades/suppliers) with funding during the various stages of their home’s construction. The "end term" or "completion" mortgage is the second part (normal mortgage) that kicks in once the construction is 100% completed. Part 2 is easy. Getting started and through part 1 without scars can be tough. The borrower does NOT get a dollar-for-dollar match for the money already into the project at any given point in time. The borrower must prove arrangements are in place at the outset (mortgage approval time) to make up any cash and timing differences between what money the draw schedule will provide you and what your builder/contractor/trades/suppliers require to start (or continue) working on your project. A worksheet / budget showing projected cash and timing requirements is invaluable to illustrate when the money is coming in and when it is going out, and to whom. Ask us if you need a template. When a draw schedule milestone is about to be met - say the Excavation and Foundation are complete - the borrower requests a progress inspection. 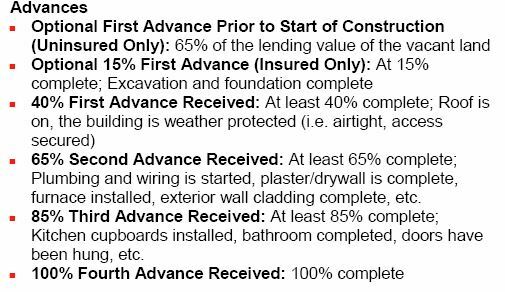 An inspector/appraiser for the bank visits the site and confirms for the bank the percentage complete using a fairly standard table such as in the example form below (form varies a bit lender-to-lender). Based on percentage complete, the draw amount is then calculated and disbursed to your lawyer, who then pays your builder on your behalf (less a builder's lien hold back as required by law). Some borrowers get a bit confused thinking simply that the bank deals directly with the builder. In fact, the bank deals with and advises your laywer only, who then disburses the money with you making up any shortfalls. Draw Amount$ = Percentage complete TIMES the total project cost* MINUS your down payment MINUS advances already made. For example: if the total project cost is $500K and your required down payment is $100K, then $400K is the max loan. 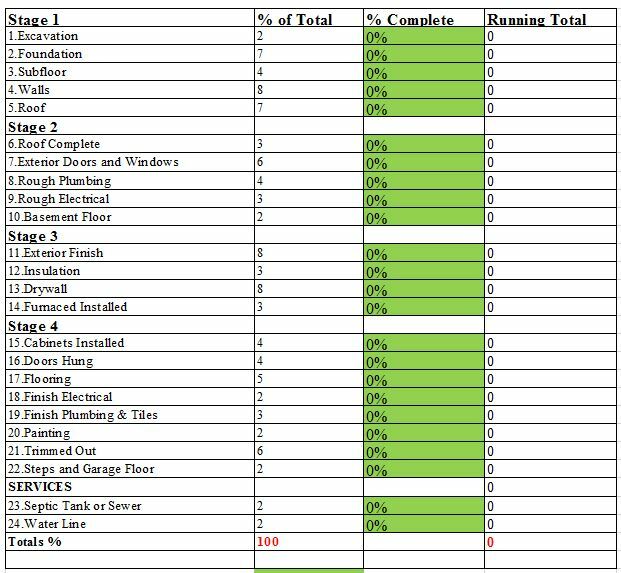 At 40% complete times $500K project cost yields $200K that should be available to the builder. And it is, being your required $100K down payment and a 40% "first advance" per the formula of $100K from the lender. Note, your down payment money always goes in before the bank's! At 65% complete, the math is 0.65 X $500K less your $100K down payment (already made), less lender's $100K initial payment (already made), yields a further $125K draw available. It is important to fully understand the timing and amount of the draws before you get too excited about building, as failure to do so will lead to a world of grief and pain for everyone. The point is worth repeating: a lender will NOT give you money for the lot nor work yet to be completed! Someone has to pay for the lot, then keep the builder, suppliers and tradespeople happy between draws. That 'someone' is either you or the builder, or the tradespeople have to agree to work now and be paid later. If you don't have enough money to start or you run out of money before the next draw (hence the trades won't work) or the draw amount is not enough, the project grinds to a halt. * when you own the lot, the total project cost excludes land. When you are relying on builder to supply lot, then total project cost includes land. You already own the lot (land title already in your name) or the builder will supply the lot and transfer title to you at first draw, regardless of whether builder has been fully paid for lot or not. Borrower already owns the lot, so the lot value is recovered from the lender throughout the draw process. Bank of Mom & Dad can and are willing to 'backstop' the project. Hire a Residential Home Builder - builder must be a member of an approved New Home Warranty Program and register the property with the program. Builder gets paid by you in stages, and in turn pays his suppliers and tradespeople. Hire a General Contractor to coordinate the project - contractor must be a member of an approved New Home Warranty Program and register the property with the program. Contractor, suppliers and tradespeople may be paid by you directly or indirectly via the contractor. Self-Build - you act as the general contractor and hire qualified, licensed tradespeople to build the home. If in Alberta, you must purchase New Home Warranty at the outset. You must also be able to demonstrate in advance that you have the time, expertise, and industry contacts to complete the project on time*, on budget, and on spec. You will need to prove you have substantial cash resources necessary to carry the project from draw to draw. Pre-Built - you simply decide all the above is too much work and decide to buy a prebuilt home from a builder and the builder gets paid only when you get the keys (upon completion). This is just a normal new home purchase mortgage, not a draw construction mortgage as described on this page. *Lenders will put a time limit on the construction phase so that they can cut their losses if you run out of money. Borrowers will need to qualify for a mortgage as it relates to standard Income, Credit and Equity lender requirements. Further, there are extra steps as they related to the property. Construction must conform to the National Building Code of Canada and any other code of provincial or local jurisdiction. In case of conflict, the more stringent code requirement shall apply. All homes built after Feb 1, 2014 must be covered under an approved New Home Warranty program (NHW). For General Contractor builds, signed construction contract including construction cost estimates, completion schedule (by Stage), and payment timing expectations per stage. Copy of 'Course of Construction' insurance coverage, which covers work in progress until completion. Copy of your building and development permit(s). If you would like to discuss whether financing a new construction build is feasible or desirable for you, please feel free to contact us and we can help make sense of all the above and estimate the draw schedule for you.